Keep up to date on professional happenings, recipes, books and relevant articles. Help your clients and foodservice staff locate sources of dysphagia-related products including preferred brands. Request Materials – We offer many materials to help further your practice, especially handouts for patients/caregivers. 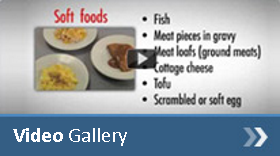 Recipes – Simple recipes to perk up meals and decrease time in the kitchen. Books – Provide valuable information, techniques, and recipes for food preparation for those with chewing and swallowing difficulties. Brands – A list of all the dysphagia-related brands available on the site. View all the options to help your clients make the best choices to fit their situation.